LotsaLotto is a powerful random lotto number generator that allows you to generate numbers using a range of options to suit your needs. You can choose the highest and lowest ball to draw, odds or evens, sequences, duplicates and even must include numbers. Download the free trial and test it for yourself today! 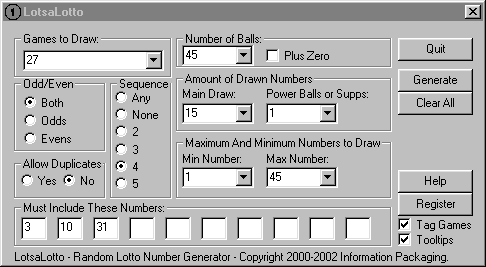 You can generate lotto or keno or other ball games, draw up to 15 balls from a total of up to 100 balls plus supps or powerballs. Generate random lotto numbers using LotsaLotto!